Here she is! My new pale pink one! Thats a beauty Spritz , I haven,t seen this one , another for the wants list ! I've got a pink and a red one and I'm waiting for them to flower. But this one is lovely. Thanks - I used to have a pink one called 'Jennifer' but it disappeared.... so that's why I bought a new one. They have thrived with the wet weather. I read that they like lots of damp.They certainly got it this year! That's a beautiful one ! As with all flowers I seem to prefer the paler shades. See who else is growing Schizostylis coccinea (Schizostylis). 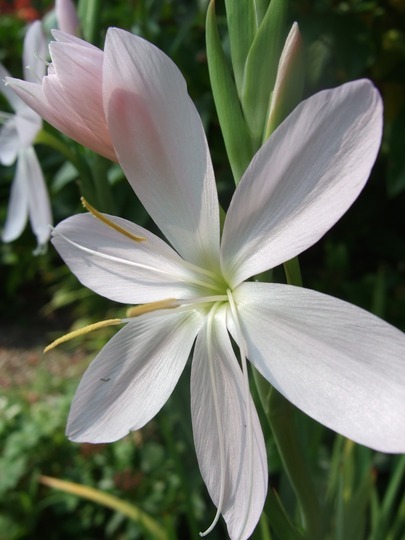 See who else has plants in genus Schizostylis.